Raith Rovers will look to call on the spirit of 2010 when they head to Dens Park on Scottish Cup duty on Saturday. 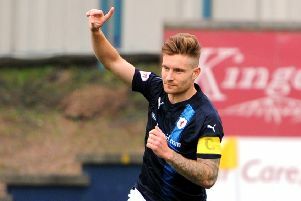 The fourth round fixture is a repeat of the famous quarter-final tie of nearly four years ago which Raith won 2-1 to reach their first Scottish Cup semi-final in 47 years. Current Rovers boss Grant Murray played that day, and he is hoping for a similar outcome in order to reach the last 16. “We had a fantastic backing from our fans that day and we managed to repay them with a great win,” he said. “That was a very hard game and we expect no different this Saturday. Rovers return to Dens just three weeks after a 2-0 defeat in the league that saw Callum Booth sent off after half an hour. “The Scottish Cup is different from the league - there’s an extra buzz about it,” Murray said. “I always think that when teams from the same division are drawn against each other form goes out the window. Dougie Hill is fit to play despite being substituted with a back injury during the 2-1 win over Queen of the South on Saturday. Liam Fox missed that match with a hamstring strain, but he is undergoing physio treatment this week and could come back into contention. Murray was pleased with the performance against Queen’s and was not concerned by suggestions that the outcome should have been more comfortable. “Games are very close in this league,” he said. “You might look at Dundee beating Hamilton 3-0 and think it was one-sided, but the reports I got was that the game was very close.